The Sweetwater Cotton Shoppe, a fabric store on Washburne Avenue specializing in quilting fabrics, recently opened its doors in downtown Paynesville. Cotton fabrics, quilting classes, patterns, books, notions, gifts, and expert advice are just some of what Mickey and April Zimmer, a mother-and-daughter team from Avon, will offer to their customers. April and Mickey Zimmer of Avon have opened the Sweetwater Cotton Shoppe, specializing in quilting fabrics, on Washburne Avenue in Paynesville. Mickey, who has been sewing most of her life, began quilting about six years ago. She loved it so much she wanted to share it with others. 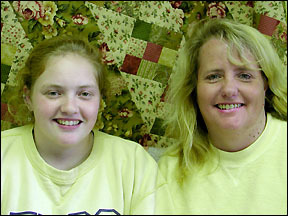 Her daughter April also enjoyed quilting, but as a recent college graduate with a degree in English, April found that her strength was writing the quilting patterns that her mother designs. With help from quilt consultant Carole Eurele, who will lead quilting classes at the shop, the duo believes area quilters, both experienced and beginners alike, can find all of their quilting needs right in Paynesville. Because Mickey also owns and operates a greenhouse in Avon, April's face will be the one most commonly seen in the Sweetwater Cotton Shoppe, at least during the greenhouse's busy spring and summer months. Currently, April lives in Avon but eventually she would like to move to Paynesville. She's a published poet, and she loves to read and hang out with her family. Family is #1 with Mickey also. She and her husband, Dale, who did all of the handy work at the shop, have two children besides April. In fact, Mickey decided the timing was right for her new venture because their youngest daughter just graduated from high school. When she's not working, Mickey likes to take her family canoeing at the Boundary Waters. Their shop is open on Mondays through Fridays from 10 a.m. to 5:30 p.m., on Saturdays from 10 a.m. to 5 p.m., and on Sundays from 12 noon to 4 p.m.